This circuit is known as the "Favourite Five". This is because it is an attractive proposition for SOTA activators in the winter to accrue 25 points in a day from five easy to climb summits without doing an epic walk. To do this in winter daylight hours the car has to be used to get from summit to summit. As take off in all directions is excellent plenty of contacts can be had using simple low power equipment, so all we carried was a Yaesu VX-170 5 watt handheld and a vertical dipole rucksack antenna. Titterstone Clee Hill, a worked out quarry with a National Air Traffic Control installation on the top of it is like the surface of the moon. It is not a pretty sight, but the view from the top is. I'd been here before, in 2008. Our next destination was Brown Clee Hill WB-002, 6 miles north. 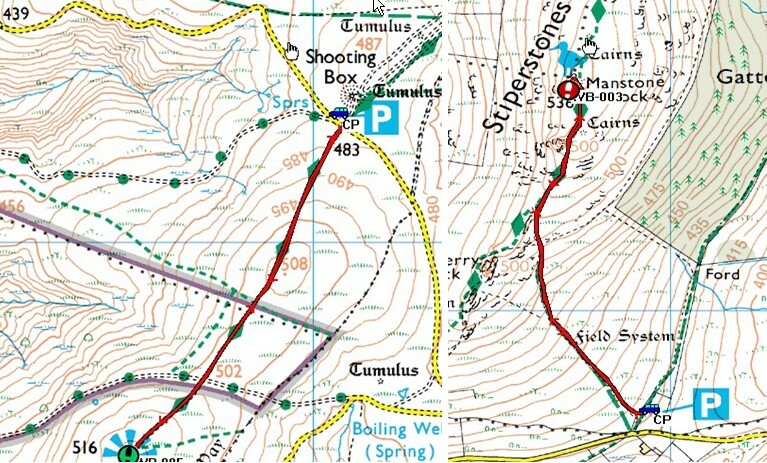 I was enjoying my time "on the maps" again calling the bends out to Geoff, it took me back to a previous life. I gave up rally navigating in 1985. 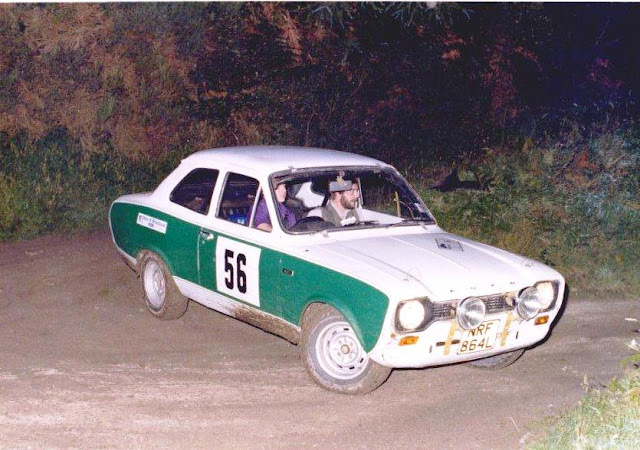 It got rather expensive and the sport had changed with less emphasis on rallying on public roads. It had become too fast and competitive and the police were starting to take an interest in what was happening. Back to walking and SOTA - the Shropshire Way took us up to the summit of Brown Clee Hill and guess what - we found another radio station as well as the one we set up ourselves! We walked into mist and were blasted with hailstones for a short period on the summit. Time to move on - north west towards Church Stretton and up the tortuous road to the summit of Pole Bank on the Long Mynd. The road sign said "Closed due to icing and snow". This didn't deter us and we continued uphill in the AWD Subaru without problem. This is quite some road and unprotected to the right where there is a 400 foot sheer drop into Carding Mill Valley. 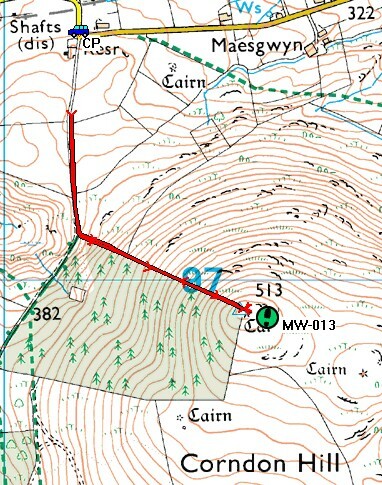 Our walk from the northern car park up to Pole Bank was on a graded track with minimal ascent. 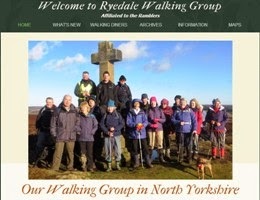 This summit was busy - the mountain bikers outnumbering the walkers. We stayed long enough to make contact with 15 stations including Barry MW0IML/P who was in North Wales on the summit of Carnedd Llewelyn NW-002. On our drive to Stiperstones I sighted a red kite following our car at close quarters, I got a photograph, sadly not good enough to place on this blog. I've seen these birds five or six times now in the Yorkshire Wolds, near Harewood north of Leeds and now in Shropshire. They were almost extinct when I was a kid and their re-introduction by conservationists and bird lovers remains controversial because of their alleged penchant for ground nesting birds nests. They are a beautifully coloured bird for sure. Stiperstones - this most distinctive hill is a quartzite ridge five miles in length and is owned and managed by the National Trust. This was without doubt our most outstanding location of the day and a place neither of us had visited before. A trig point is located on the top of its jagged highest point of Manstone Rock and this is where we set ourselves down for 30 minutes in complete comfort. The sun was shining on the righteous and we had shelter amongst the rocks from the wind. To quote Wainwright "God was in his heaven". This protected area suffered an horrendous fire in July 2012. The fire decimated part of the reserve and 70 fireman battled the blaze for seven hours with the smoke being seen many miles away. Little evidence of this was found around the area we visited. We made 12 contacts from the top, including one with Rob GW7LAS/P on the summit of Cadair Berwyn in North Wales. From our perch we had a good view into Powis, Wales and Corndon Hill - our fifth and final climb was seen most prominent four miles to the south west. We motored from the car park to Shelve and crossed over the A488 to reach the track leading to Corndon Hill. It was a steep ascent, something we are well used to and from the car to the top took us just sixteen minutes. From this point on we moved over to our Welsh callsigns of GW4OBK and MW6PYG. We made seventeen contacts before returning to the car and the drive back on mostly A roads to Malvern, which we reached at 4.45 pm. I took a break from navigation duties and let the Satnav do the work for Geoff. 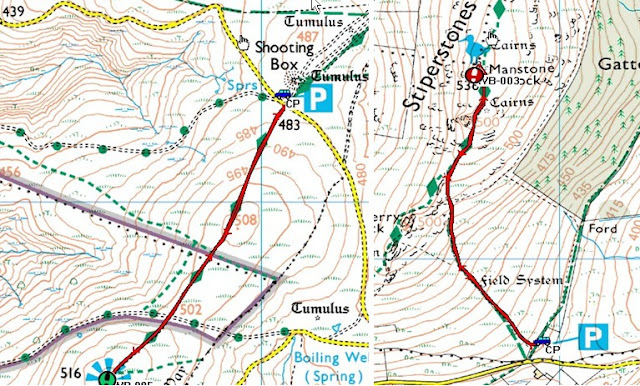 This had been a most enjoyable day of road navigation, walking, climbing and amateur radio with 61 stations logged.